Ossy Renardy was a famous violinist from Vienna, Austra. He was famous for playing all 24 of the Paganini Caprices during his time. Unfortunately, the promising Ossy Renardy was killed in a car accident in the US in 1953. He was only 33 years-old then. 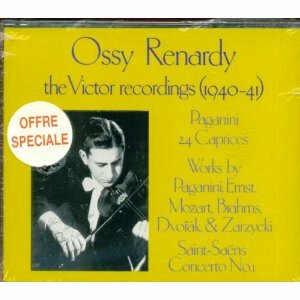 Ossy Renardy was born in 1920, in Vienna, the capital city in Austria where he began his career in violin. At the age of 11, he started to perform in the public, but he returned to Vienna to complete his studies, before pulling off his first formal performance at age 13. In 1937, 4 years before the start of World War II, he toured the United States for live public performances. Then, he was already playing for the USO (United Service Organization). During World War II, he served in the United States Army. After the war, Ossy Renardy spent two years working and studying, before returning to the concert stage. In 1948, he performed throughout the North America, Europe and Isreal. He had also played with world renowned orchestras – the Boston Symphony, the Chicago, the St. Louis, Los Angeles, San Francisco Symphony. While it was not known if Ossy Renardy won any major competitions during his violin career, one of his greatest achievements as a young violinist, was him playing all 24 of the Paganini Caprices. He performed all 24 in the second half of a recital at Carnegie Hall. Looking back, Renardy said that he would not perform all 24 of the elegant, yet difficult Paganini Caprices again. However, he had made all of his 24 pieces available to everyone in form of recordings. During his violin music career, Renardy played on the Carrodus Guarnerius violin, which survived the car crash he was in. The Carrodus exchanged several hands after Renardy’s passing, until it was surfaced again in a public auction in 2007. Paganini Caprice No.17 played by Ossy Renardy. Enjoy!